FDCM Clerk Recruitment 2014 – Get Job in FDCM (Forest Development Corporation of Maharashtra). FDCM latest recruitment for the month of July of 185 posts including Forest Guard, Clerk, and Driver Vacancies. 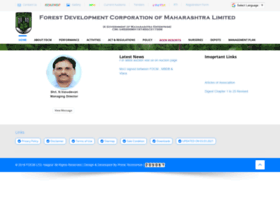 FDCM/ Forest Development Corporation of Maharashtra has invited this Employment Notification on the basis of Permanent Government Jobs at Nagpur and Chandrapur Regions. Eligible candidates can apply before 22nd July 2014 for 185 posts (Clerk). All who want to be part of FDCM, they can apply for the current Forest Guard, Clerk, Driver and Other posts in Nagpur and Chandrapur Regions 2014. Send your application prescribed format along with photo copies of yours documents age proof, educational qualification, experience certificate, caste certificate, to following address on or before 22nd July 2014. For Nagpur Region: The Regional Manager, Gorewada Project, Nagpur, Ne Tollgate No.11, Makardhokada, Kotal Road, Nagpur-440013.